It's been awhile since I've posted any toys vinyl art - and that coincides with the fact that I really haven't purchased any new pieces lately. I love Kozik pieces, but I feel like his work for KR has been a bit mundane and predictable of late. 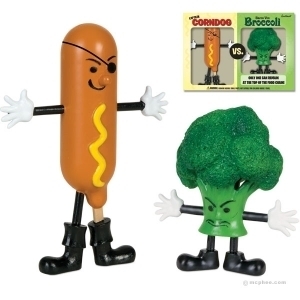 I stumbled on this Captain Corndog vs Baron von Broccoli set over at Toy Joy's site (more info on the store below). Could potentially be a new addition to the toy chest art display case. Toy Joy is a true Austin original. We are an independent toy store and were established in 1987 to supply locals with meaningful toys. Toy Joy soon became famous for it's revolving stock of strange knick knacks and exotic goods. The concept grew along with the city, and soon Toy Joy became one of the largest and most popular toy retailers in the US. People were traveling from all around the globe to experience a less typical children's retailer. In 2008 Toy Joy found new ownership with a couple who have dedicated their life to toys, and the pursuit of fun. Expanding into the space next door, adding a cafe with vegan soft serve and bubble teas, and a “Tokyo Toy Joy” for a more complete tour of light-hearted design and nostalgic playthings.